The next in a long line of legendary accordion festivals laid on by the ever-energetic Heather Smith. A great line-up of British favourites: Pearl Fawcett, Stefan and Denise Andrusyschyn, David Vernon, Bert Santilly, Alan Young, Rosemary Wright and the Peter Pan of jazz accordion Harry Hussey! 8th/13th May 2016 at the Norbreck Castle Hotel, Blackpool. Book your accommodation by tel. Sceptre Promotions on 01780 782093 (office hours) for a wonderful relaxing ‘accordion week’. 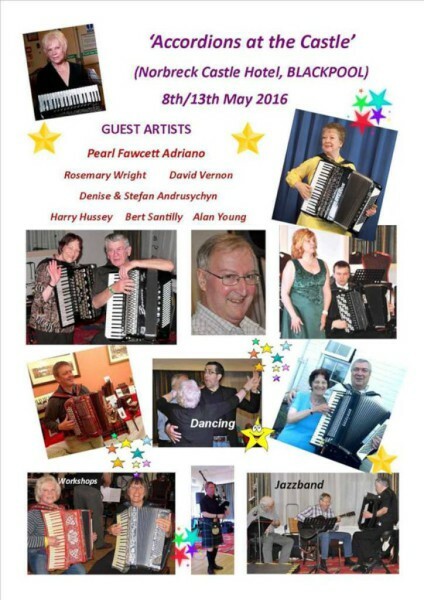 This year I’ll be welcoming Pearl Fawcett Adriano to ‘Accordions at the Castle’ for the first time, although Pearl has performed at several of Heather’s previous festivals in Norfolk. Enjoy the friendly atmosphere of an accordion festival with all it’s concerts and workshops.